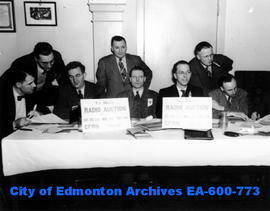 Preparation for the YMCA Men's Club Radio Auction over station CFRN: (L-R) Clark Ready, Harry Robertson, Harold Campbell, Maxwell C. Dewar, William Milton, Ralph LeDrew, Harold Sprague, William Pettigrew, Harold Banks and George Plowman. Hennig, RudolphMowers, NettieBoalch, Mrs. E.H.
A.J. Hooke at Robertson United Church Men's Club bean supper, with Doug Jones, club president. Beta Sigma Phi gala bazaar: Mrs. Weldon Fitzsimmons and Mrs. D. Smith take their turn in Christmas workshop. Beta Sigma PhiFitzsimmons, Mrs. WeldonSmith, Mrs. D.
Glee Club director, Mrs. E.W. Simmons, prepares for Friendship Club's Cinderella production. Cattle and Horse Breeders' Association meeting. 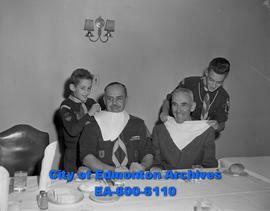 (L-R) Roy Ballhorn, A.J. Dexter, who gave a special address, and James Paul. New officers of Retired Railroadmen Veteran's Association. (L-R) Lin Bell, J.M. Brennan and George Ware. Bell, LinWare, George W.Brennan, Jack M.
Alberta British Commonwealth Association officer (L-R) Richard Hardie, Stan Dutton and Harry Paull.